It's hard to admit at times, but there are brand names so sentimentally ingrained within our 20th Century consumer psyche, that their disappearance would feel like the death of a loved one. 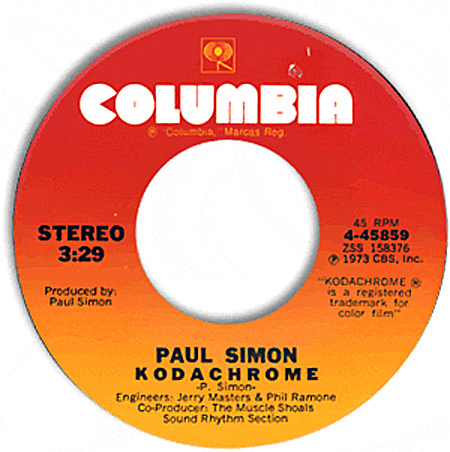 Maybe none more so than Kodak, but that's exactly what happened when the company filed Chapter 11 this week in U.S. Bankruptcy Court, thus going to that big pop culture world's fair in the sky. They leave behind a $6.8 billion debt, and an even bigger hole in our materialistic lives than when Polaroid bit the dust in 2001. There are talks of reorganizing, blah blah blah, but experts seem to agree that it doesn't look good at all. Let's face it... for the Pepsi Generation, life was a Kodak moment! Or so it seemed. 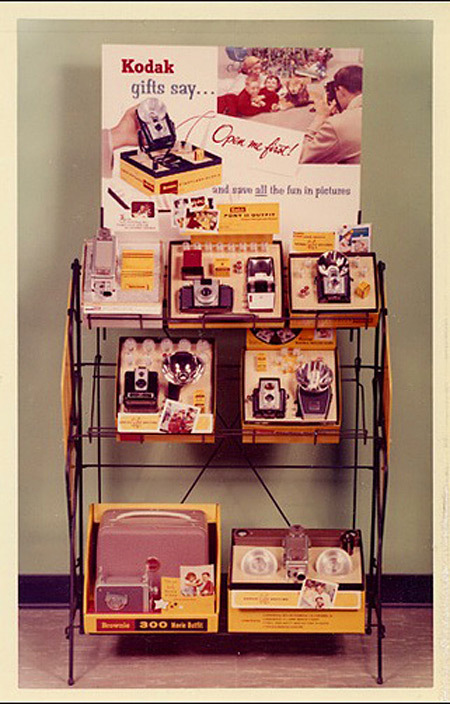 Promotional postcard of Kodak product display. Thanks to Roadsidepictures. 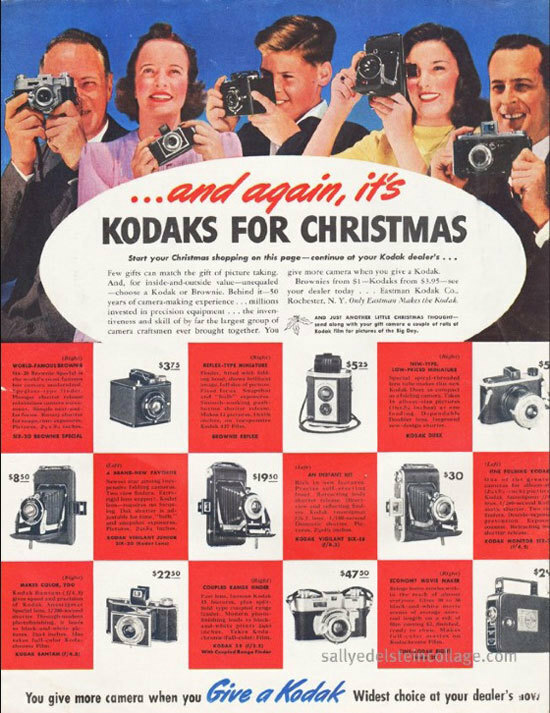 Kodak Christmas ad, 1940. Thanks to Sally Edelstein. 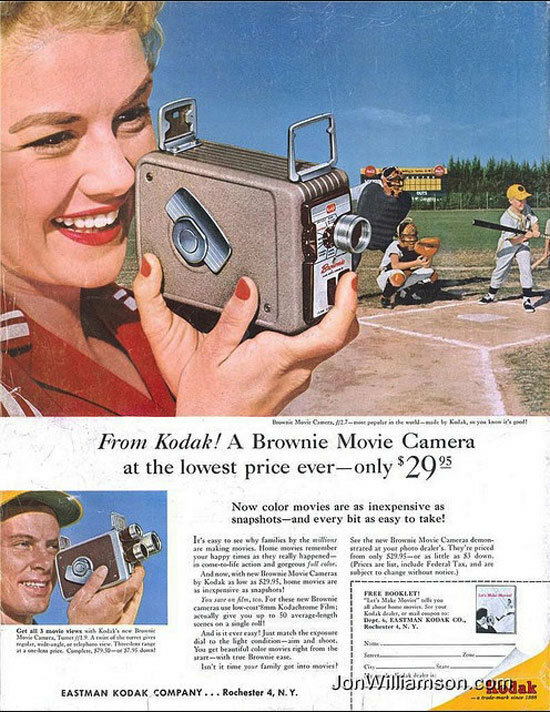 Saturday Evening Post ad for Kodak Brownie movie camera, 1957. Thanks to Jon Williamson. 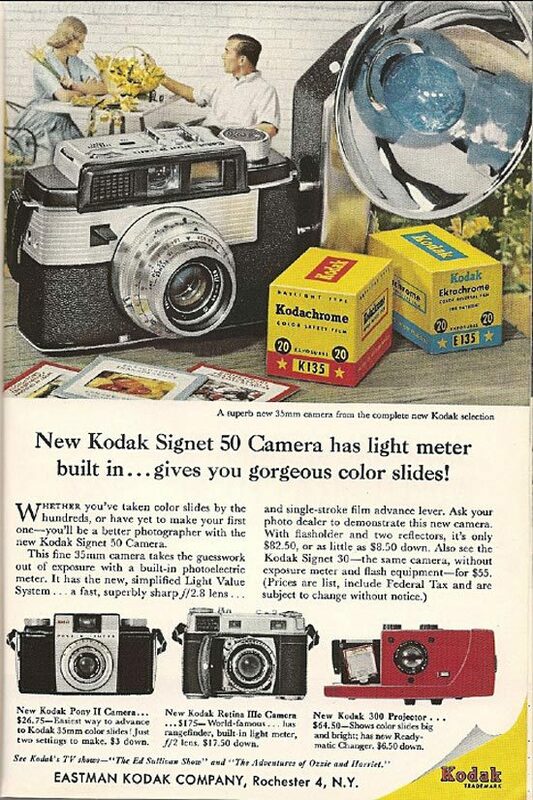 Kodak Signet 50 camera ad, 1958. Thanks to Roberto41144. 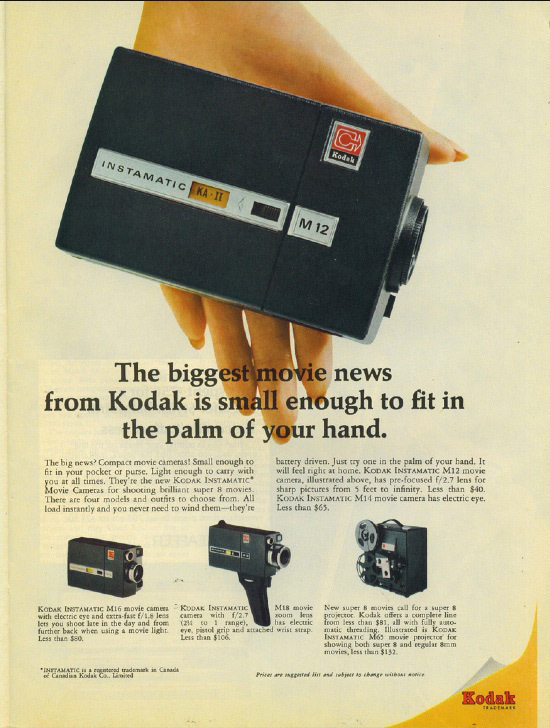 Time Magazine ad introducing the compact Instamatic movie camera, 1967. Thanks to Connor Malloy. For client presentations, we've all been touched by one of these babies in one form or another. 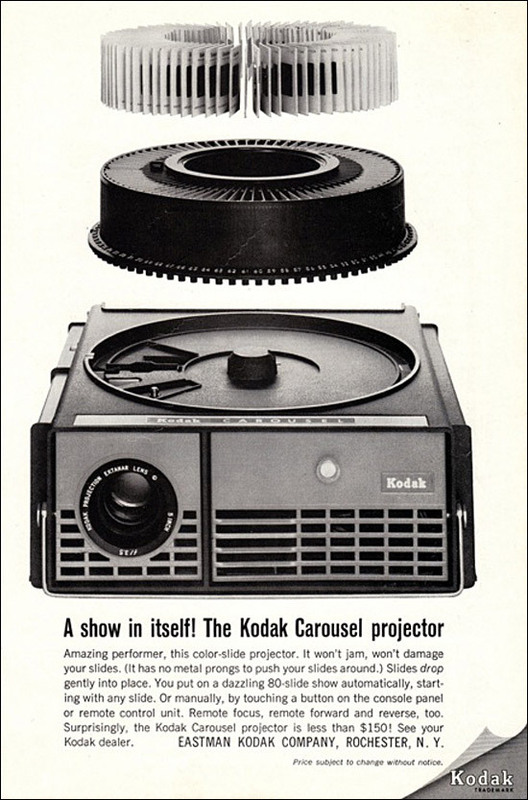 An ad for the Kodak Carousel, 1964. Thanks to Cosmos Lutz. 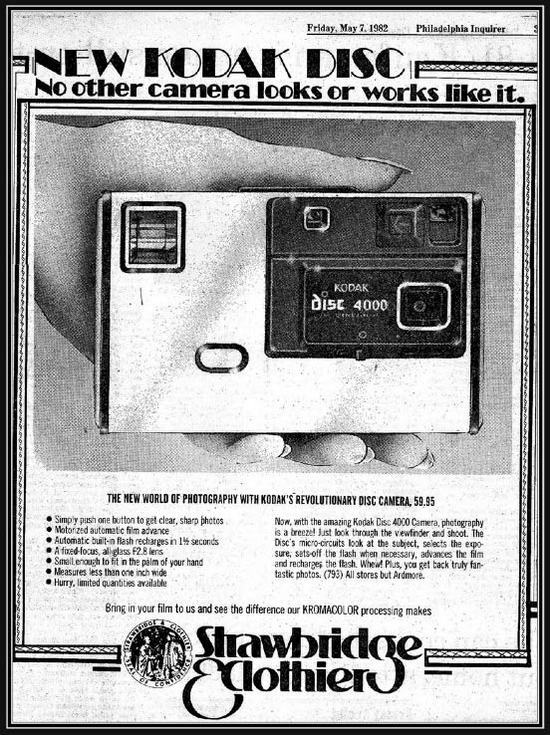 A 1982 newspaper ad for one of Kodak's odder answers to modern technology: the Kodak Disc 4000. Thanks to Backyard Woods Explorer.